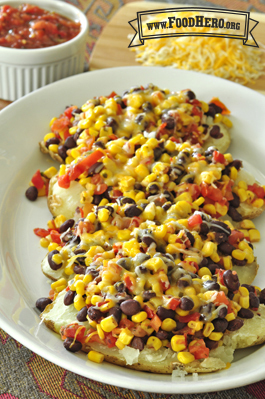 3 Comments for "Southwestern Stuffed Potatoes"
I love how simple this recipe is. I made this with a green salad for dinner! As an adult, I love all the ingredients in this recipe, but it's a little intimidating for kids...so much STUFF piled on top of the potatoes. We just prepared this as part of a kids cooking daycamp featuring Food Hero recipes. The kids enjoyed using the microwave for cooking. I asked them all to take at least one bite "as is" so they could do the Kid's Tasting Survey, so they did. Most of the kids liked them, especially with kid-friendly cheese melted on top. Three cheers to the kids for tasting even though it looked a little intimidating! It might look more 'kid firendly' if the servings sizes were smaller or the potatoes were flattened a little more so they spread out more to hold the toppings. Kids are more likely to taste foods they help make.